Another relevant panel from Moth & Tanuki - upcoming black-and-white episode 4 - from the same page as the panel used for Illustration Friday "Clean" a little while ago. I would have posted this earlier in the week, but I'm really sick - finally feeling a little better today. Nice work! And I hope you feel better! Nice piece! Hope you're feeling better! I'm so sorry you've been sick. Feel better! ohh that lots of good stuff actually. i hope you are much better now. i have been down also with i hope is not flu and i hope i am getting rid of it already. 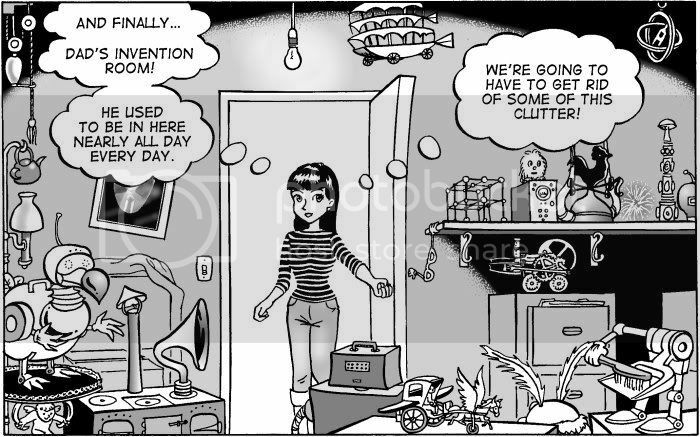 Hartini, at least one of those items in the room is already inherited - a bit of an in-joke for people who've read some of my other comics. The most important piece in the room (in terms of the current story) is pretty well hidden - this is from an upcoming 16 page two part epic in OzTaku. I'm feeling a bit better, though it is dragging on a bit - this is a really bad bug, but I've been luckier than some I know have been with it. Hope you're feeling better too, Isay!